Update: Read the analysis of 2016 nonemployer establishment data. Last week’s release of the new Bureau of Labor Statistics (BLS) Contingent Worker Survey (CWS) has renewed public interest in tracking the number of self-employed or independent contractors. The upcoming release of the U.S. Census nonemployer establishment data for 2016 this Thursday will provide another useful data point about the trends in self-employment. As we will show, there has been a significant increase in the headcount of nonemployer establishments. However, the economic impact, as measured by the share of nonemployer establishment revenues in total revenues, has not increased in roughly 20 years. This indicates that the growth of nonemployer establishments seems to reflect the growth of self-employed individuals operating unincorporated businesses that generate very little revenue. Figure A shows the rapid growth of nonemployer establishments since 1997. The data for the Economic Census years (every five years, in years ending in 2 or 7) are noted with red markings to indicate their more reliable trend. 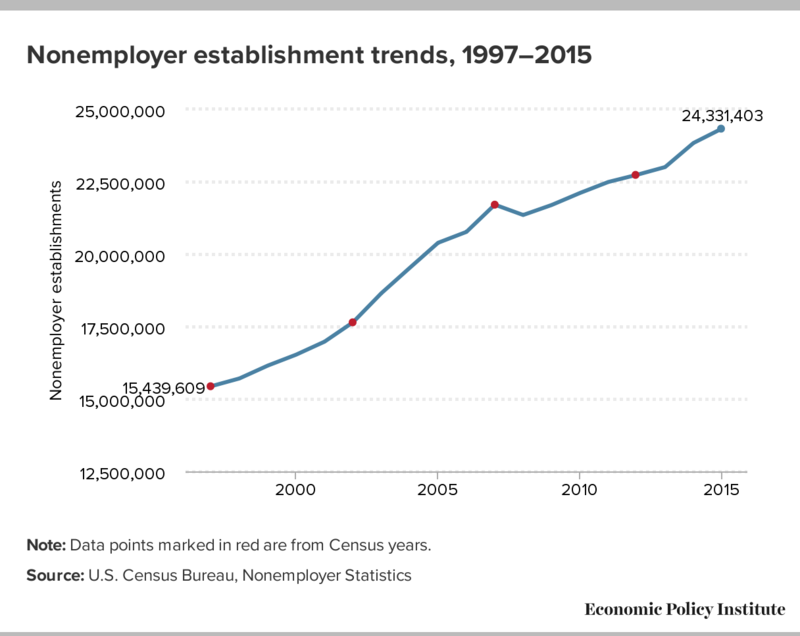 The latest data on the number of nonemployer establishments in 2015 were respectively, 12, 47, and 58 percent greater than in 2007, 2000, and 1997. In contrast, the number of firms and establishments with employment grew by much less, respectively, by 6.5 and 11 percent from 1997 to 2015. These trends confirm, as other headcount measures have also shown, that self-employment activity grew far faster than that of regular establishments. Note: Data points marked in red are from Census years. But what is the economic scale and impact of this rise in nonemployer establishments? The Census Bureau provides data on the total receipts (i.e. revenue) of nonemployer establishments each year, enabling us to assess the growth of their economic impact in terms of the amount of revenue and the share of total revenue earned by nonemployer establishments. We adjust revenues by the growth of the Gross Domestic Product (GDP) price index to track trends in “real” (or inflation-adjusted) revenue. Doing so allows us to see that from 2000 to 2015 the number of nonemployer establishments grew far faster, 47 percent, than their total real revenues, up just 20.5 percent. Inflation-adjusted revenues per nonemployer establishment fell by 18.1 percent from 2000 to 2015. These trends suggest that the net growth among nonemployer establishments was among establishments with very low revenues. Again, this evidence is consistent with much self-employment being supplementary side-work rather than a person’s main job. How much has the economic importance of nonemployer establishments increased since 2000 or from prior to the Great Recession? It turns out that there has been no increase in the economic scale of nonemployer establishments. 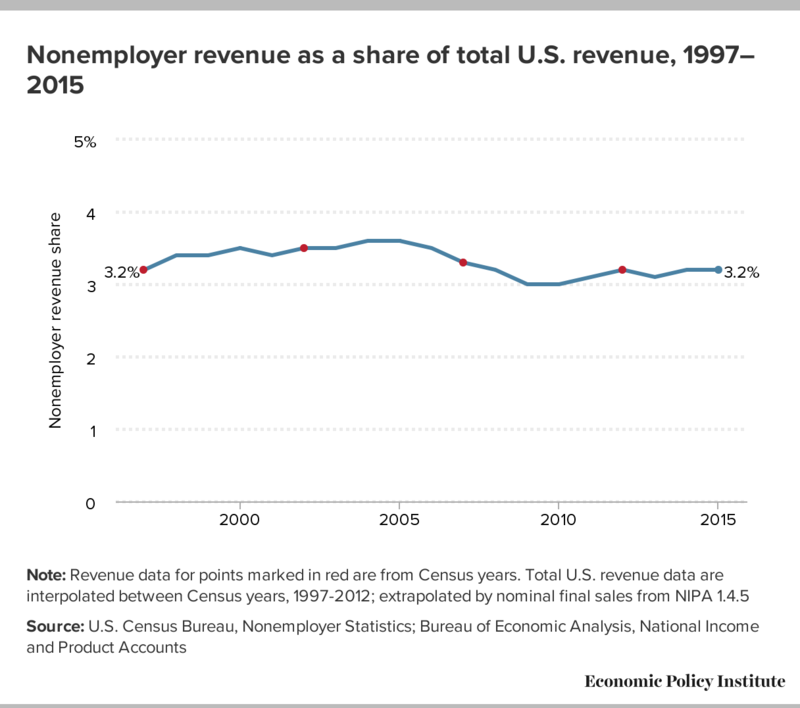 Figure B shows that nonemployer establishments’ share of total (nominal) revenue has not grown in the 18 years since 1995, maintaining a roughly 3.2 percent share of total revenue. The table below shows that, in absolute terms, total real revenue grew faster in the overall economy than among nonemployer establishments. In fact, since 2000, real revenue grew more than 50 percent faster in the overall economy, 32.5 percent, than among nonemployer establishments, 20.5 percent. Since 2007, which includes the rapid growth of online platform activity, nonemployer establishment revenue grew by only 2.5 percent, considerably slower than aggregate revenue growth of 8.2 percent. The nonemployer establishment data do show a rapid rise in taxi industry nonemployer establishments, presumably reflecting the growth of Uber and Lyft: up from 192,000 in 2011 to 480,000 in 2015. The economic impact of this surge in activity was blunted, however, as the real revenue per taxi nonemployer establishment fell by 34 percent from 2011 to 2015. The nonemployer establishments in the taxi industry have grown to 2.0 percent of all nonemployer establishments by 2015 but generate just 1.0 percent of all nonemployer revenues. It is a familiar story: Lots more activity, not much of an economic impact.